Ever since I can remember, I've carved pumpkins every. Single. Year. Do you know how many years I cooked with ctual pumpkin. None! Well, that is, until this year. That's right! I've officially broken into the beast. I hollowed out and roasted every ounce of that giant gourd, and I loved every second of it. 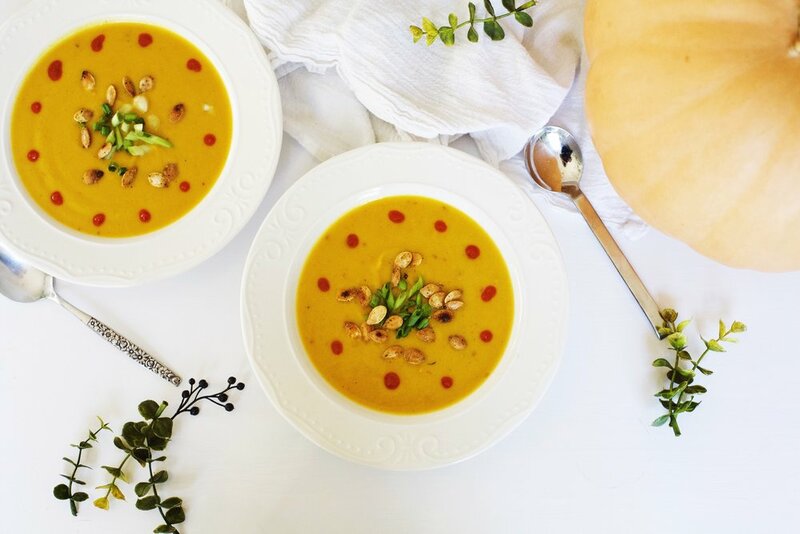 Don't be fooled by how simple the ingredients in this soup are -- it's absolutely divine! If you're not really a pumpkin person, this could make you a convert. Seriously. I've been sitting on the recipe for about a month, as the holiday season and work have gotten the best of me! As you may have seen on my Instagram stories, I'm taking a podcast break until the beginning of 2017. I have so many incredible interviews lined up, and I just can't wait. We also have some more big news, and I can't wait to share! Give it about one more month, and I can let you know for sure what's going on. In the meantime, try this excellent soup out! If using whole pumpkin, roast in oven on 425 degrees F until soft (approximately 30 minutes). In a high-speed blender, combine pumpkin, chickpeas, coconut milk and coconut oil and blend until smooth. In a large pot over medium-high heat, add soup and cover. Once the soup comes to a simmer (bubbles form at the top), reduce heat to medium-low heat, add remaining ingredients, and cover. Cook for 20 minutes. We Covered a Christmas Song...with Monica Martin!